Thank you to the First State Bank of Bloomington, Heyworth Branch for sponsoring a book light prize for every child that completes the Heyworth Public Library summer reading program. Every Hero Has a Story – Find yours this Summer at the library! 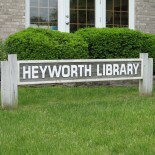 This entry was posted on June 22, 2016 by Heyworth Public Library District.